Mac Lackey got the idea for an online management tool for soccer clubs while attending a tournament with his young daughter. When he realized the registration process began with three-ring binders, he decided to automate it. In 2011, he founded KYCK.com, which now is a part of NBC Sports Group. 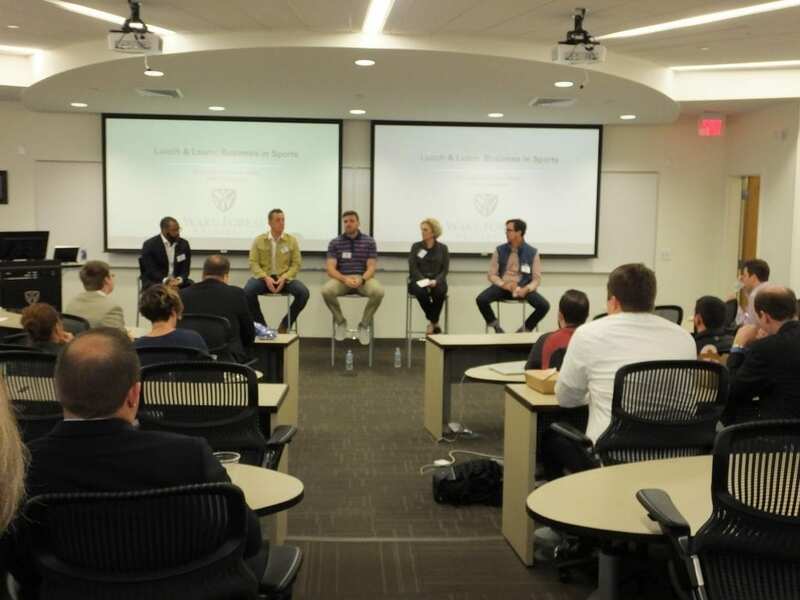 The “Business in Sports” Lunch & Learn hosted by the School of Business at WFU Charlotte Center on November 29 brought together entrepreneurs who found their space in the sports world in very personal ways. Adam Hummel started LuDawgs.com as a sports handicapping community but noticed explosive growth in a small part of the site: daily fantasy football. He spent time growing that segment and then sold LuDawgs to Anthem Sports & Entertainment Corp. in 2015. “It was a $90 investment on my part, and I ended up getting really lucky,” he said. His new venture, the subscription-based DailyRoto.com, provides news and insight to more than 60,000 fantasy sports players. One key growth area he’s tracking is eSports, which pits video game players against one another. Fans have started to build fantasy teams of eSports stars. After playing basketball for Davidson College and then professionally overseas, Brendan Winters turned his own passion for the game into Pro Skills Basketball, a youth league that focuses on skills development and a positive experience for athletes. The group, which has a partnership with Under Armor, began in Charlotte and has spread nationwide. In fact, the growth of corporate sponsorships in youth sports is a trend that all four panelists recommended watching. “Professional sports partnership marketing has become so expensive that companies are looking for opportunities in youth sports,” Winters said. Dockery Clark, founder and managing partner of BlueCap Marketing, which focuses on sports, entertainment, and event-based initiatives, said it’s all about value creation in the evolving sports sponsorship arena. “You need to be ready to invest in all those touchpoints if you want to get value,” she said. Clark, who has served as an academic leader for the Sports Marketing Institute at WFU Charlotte Center, said sponsorships can help create a “sense of bigness” for companies that can’t get it anywhere else. The goal of the Lunch & Learn series is to bring together industry experts, alumni, and students to enrich the experience and build relationships at WFU Charlotte Center. Matt Briggs (’00), a former scout for the Toronto Blue Jays, said he appreciated Clark’s insights on corporate sports sponsorships. Alicia Roberts is a freelance writer, editor and communicator, based in Charlotte, N.C.